I have a confession. I am a sock knitter. I’m not sure what happened. I was going along, knitting a little here and there, reading blogs about how fabulous hand-knit socks are and ignoring the hype… and then I knit a sock. 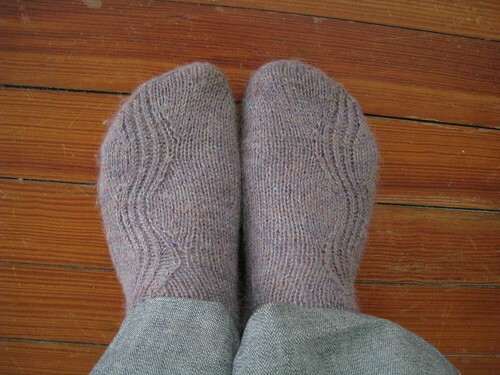 It started innocently enough; I made M some slipper socks for Christmas. The problem is they were easy to make and they came out looking like a pair. AND they were well received. Next thing I knew I was trolling through Ravelry‘s sock patterns, and digging out some lilac-colored alpaca from my stash. It still seemed like a manageable experiment. 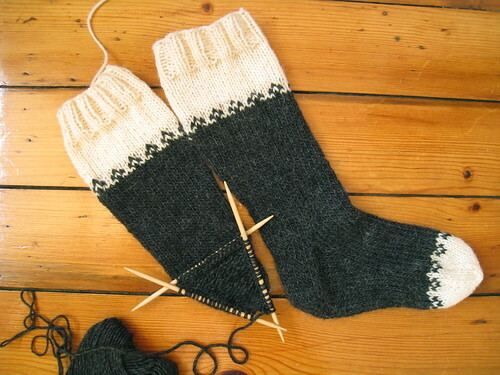 I can stop at any time, I told myself as I plowed through the Kalajoki socks. No problem. No problem until I put them on and wouldn’t take them off for longer than I care to admit. They felt soooo good. Turns out all them sock knitters weren’t kidding about how comfy-fabby-warm hand-knit socks are. M’s birthday was in February and I used the celebration as an excuse to knit him some socks. And, tellingly, to buy more sock yarn than needed. By then I’d read a blog post about 12 sweaters knit in 12 months, and had seen that The Yarn Harlot knits a pair of socks per month, on top of her other projects. I just knit 3 pairs of socks in 3 months, I thought. I could totally knit 12 pairs in a year! 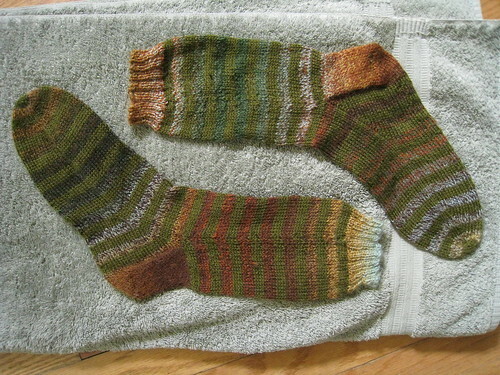 So March found me knitting my own pair of stripey socks with the leftover birthday yarn + some old green stash yarn. I’m just using up leftovers, I told myself, still in denial. I’m in trouble, friends. We’re a third of the way through the year and the rash shows no sign of abating. This entry was posted on Monday, April 18th, 2011 at 7:28 pm	and is filed under knitting & crochet, things I make when I should be making other things. You can follow any responses to this entry through the RSS 2.0 feed. You can leave a response, or trackback from your own site. Awesome! Go sock knitter, Go! Socks are useful and these are so lovely. Just looking at them gives me a sense of satisfaction. Can only imagine how it feels to have made them–kind of like a cupboard full of homemade jam? I love these! So pretty and ripply. I bet you could make 90 socks in 90 days. You are inspiring me to get back to sock knitting. I have a pair on needles for my niece that are calling out to me now! 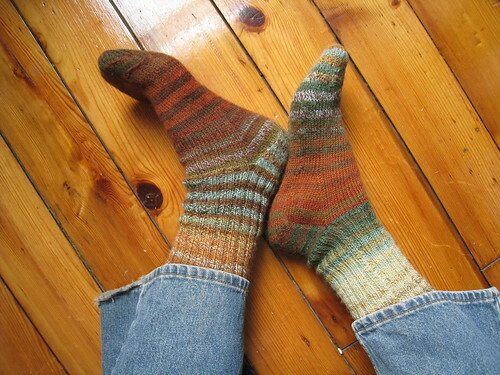 after knitting christmas socks, i knit myself a couple pair and I love them, even on hot days. right now I am finishing some birthday socks and then on to some royal blue socks for me and now i cam constantly looking for sock yarn deals and I never ever thought I would enjoy knitting on these tiny kneedles but i love it. Your socks are beautiful, especially the “wellie” socks. I love sock knitting, too! It’s such a nice, small, portable project. Now if I could just figure out how to finish the toes off properly. . . .